A printer isn't the most convenient of peripherals. They look out of place on most work desks and create quite a racket when spitting out pages. You could throw a few hundred quid on a snazzy new network printer that sits in a corner somewhere and can receive print orders from any computer on the local network or you could just hook your regular USB printer to the Raspberry Pi and enjoy the same conveniences offered by top of the line network printers. If you haven't already used your printer on Linux, before you get started with this project head to the Open Printing website to check whether your printer is compatible with the CUPS printing server software. If your printer is listed, hook it up to the Raspberry Pi using one of the USB ports. For this project, we're using the Raspbian distro and the Raspberry Pi is connected to the local network via a compatible wireless adaptor. However, you can also hook the Raspberry Pi up to your network via the wired Ethernet port. 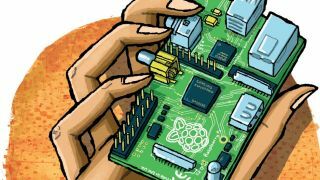 You can follow the instructions in this tutorial by accessing the Raspberry Pi remotely from any other computer on the network. Just make sure that the SSH server inside Raspbian is enabled by using the raspi-config tool. It's also a good idea to assign a fixed IP address to the Raspberry Pi. You can do this easily from within your router's admin page. For this tutorial we'll assume that the IP address of your Raspberry PI is 192.168.3.111. When it's installed, add your user to the group created by CUPS called lpadmin that has access to the printer queue. Here we use the usermod tool to add ( -a ) the pi user to the lpadmin group ( -G ). By default, CUPS can only be configured from the local computer that it's installed on. You should now be able to access the CUPS administration panel via any computer on your local network by pointing the web browser to your Pi. Then follow the walkthrough over the page to add your printer to CUPS. Some Linux distros ship with a restrictive iptables firewall policy that doesn't allow connections via the CUPS ports. If you connect to the Raspberry Pi via Ethernet instead of a wireless adaptor, modify the command and replace wlan0 with eth0 . When you are through setting up your printer using the CUPS administration panel, it's time to make it accessible to other machines on your network. While Linux distros will have no trouble detecting your new network printer, making them visible to Windows and Apple devices requires a couple of extra steps. Then scroll up to the Global Settings section at the top of the configuration file. Modify the workgroup parameter within to point to the name of your workgroup, which by default is named WORKGROUP . Now save the file and restart Samba with $ sudo /etc/init.d/samba restart . Then head over to the Windows machine and launch the Add New Printer wizard and click on the option to install a network printer. Thanks to the modified Samba configuration, the wizard will detect and list any printers hooked up to the Raspberry Pi. If you have Apple devices, you can enable support for Apple's AirPrint system, which allows you to print from the iPad and iPhone. For this, just install the Avahi daemon with sudo apt-get install avahi-daemon on the Raspberry Pi, which will then make the connected printer visible to AirPrint-compatible devices. In addition to the ability to use our network printer from within graphical applications across all platforms, we can also use it to print from the command line interface. Furthermore, we can also interact with the printer using the Python programming language.